Historic New England - Historic New England may have more notable attractions and museums than any other region in the U.S. From the Christa McAuliffe Planetarium in Concord, N.H. to famed attractions like Old Sturbridge Village and Plimouth Plantation, the six New England states - Vermont, New Hampshire, Massachusetts, Maine, Connecticut and Rhode Island - offer over 300 years of charm and American history. 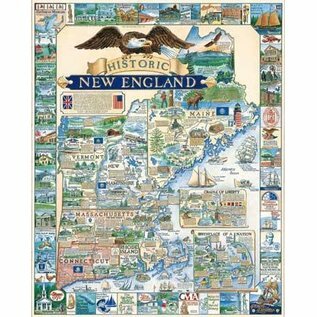 Historic New England features a map of museums along with tidbits of New England history that make putting it together lots of fun and a great learning experience about the area for the entire family. 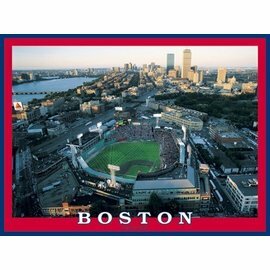 Whether you're from New England, planning to come here to visit or live, or just want to learn more about it, this puzzle will be a treasure. 1000 pieces. Finished size 24" X 30". 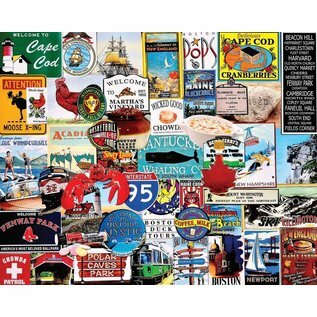 Best of New England - This Best of New England jigsaw puzzle features some of the greatest places to stay and visit in the region. 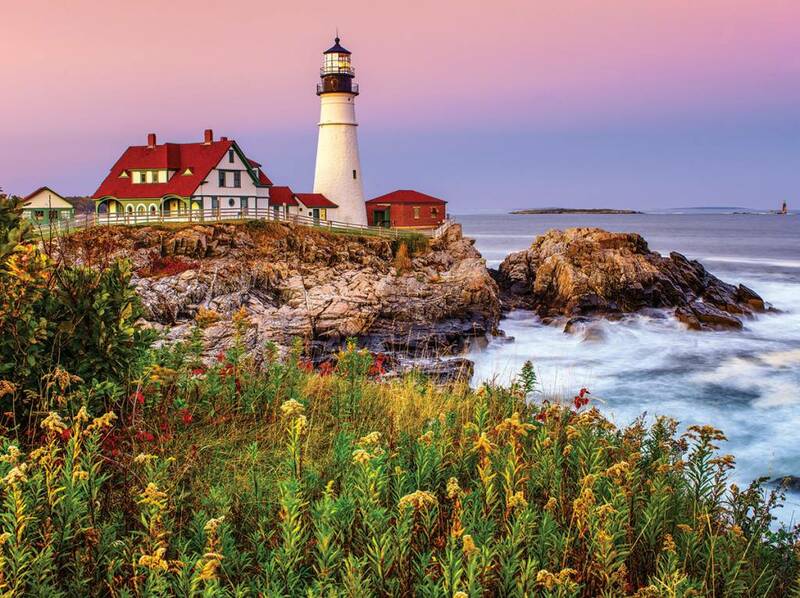 Featuring popular spots and historic sites across the six New England states, Maine, New Hampshire, Vermont, Massachusetts, Connecticut and Rhode lsland. 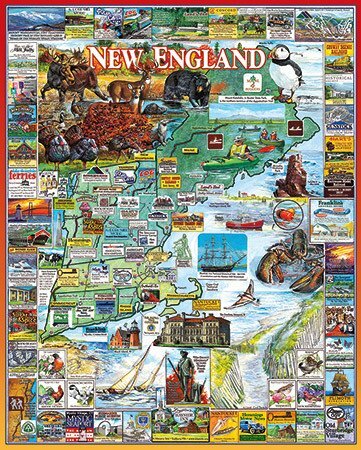 This jigsaw puzzle makes a perfect gift for anyone who loves New England and all it has to offer: both those who live here now and those who fondly remember New England from the past. 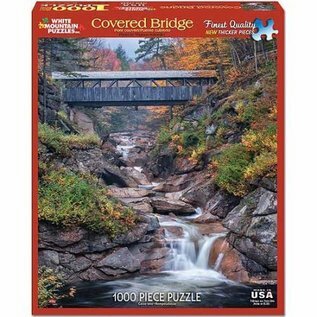 1000 piece jigsaw puzzle: Finished size 24" x 30"
Covered Bridge - This gorgeous covered bridge puzzle will be a challenge but well worth the effort when finished. It features the Sentinel Pine Covered Bridge located in New Hampshire's scenic Franconia Notch State Park in autumn. This beautiful rustic structure is suspended over 100 feet above a pool of water as the Pemigewassett River cascades through the White Mountain National Forest. 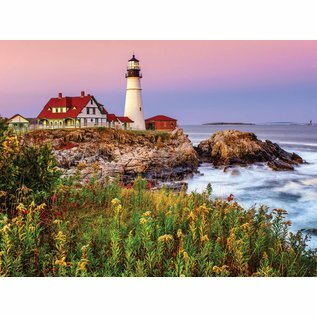 1000 piece jigsaw puzzle: Finished size 24"" x 30"
Maine Lighthouse - The Portland Head Light, located in beautiful Cape Elizabeth, is the oldest lighthouse in the state of Maine. In 1787, while Maine was still a part of Massachusetts, George Washington commissioned two masons from nearby Portland, Jonathan Bryant and John Nichols, to oversee construction of the lighthouse using easily sourced local material since our early government was not very well financed. The lighthouse was completed on January 10, 1791 with its first keeper, Joseph K. Greenleaf, appointed by George Washington. The light is still in use today and well worth a visit to the rocky coast of southern Maine. 1,000 piece puzzle. Finished size 24" x 30". 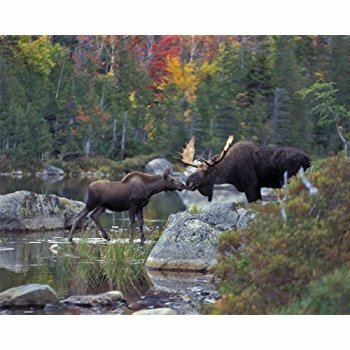 Kissing Moose - 1000 piece, finished size 24"x30"
New Hampshire: The Best of New Hampshire jigsaw puzzle is all about the home of White Mountain Puzzles. 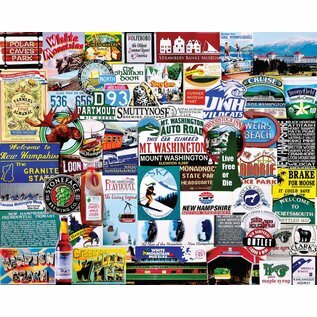 It features the best of what the Granite State has to offer. New Hampshire is chock full of scenery, wildlife, and history, and is a sportsman's paradise in all seasons. 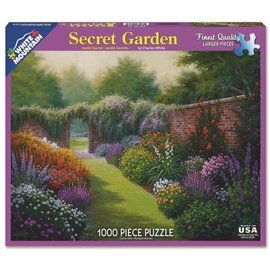 All are featured in this terrific jigsaw puzzle. 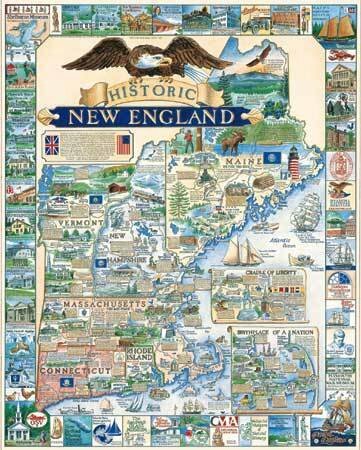 Did you know New Hampshire was the first state to adopt its own state constitution? 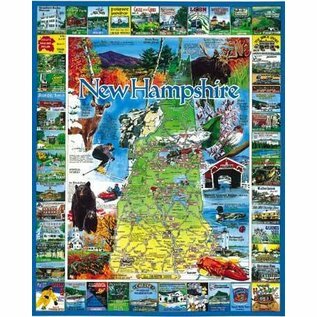 Insets around the puzzle border add challenge and allow this jigsaw to be jam packed with more of New Hampshire's best destinations. 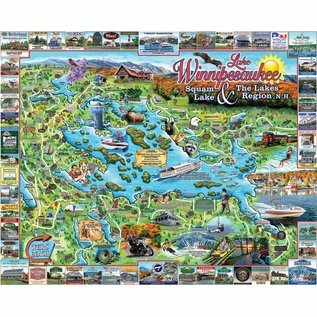 1000 piece jigsaw puzzle: Finished size 24" x 30"
Lake Winnipesaukee - Lake Winnipesaukee, Squam Lake & The Lakes Region NH. In 1771 Colonial Governor John Wentworth established “Kingswood” in Wolfboro on the shore of Lake Winnipesaukee, the first summer estate in New England. The town’s motto is now “The Oldest Summer Resort in America” and the surrounding towns & villages of the Lakes Region are equally charming and well worth a visit. Winnipesaukee is the largest lake in New Hampshire and third largest in New England, approximately 21 miles long with at least 258 islands. The Winnipesaukee Indians were a subtribe of the Pennacook, living and fishing at a village called Acquadocton which is now known as The Weirs. Squam Lake was originally called Keeseenunknipee but was later given another Abenaki Indian name, Asquam, meaning “water”. 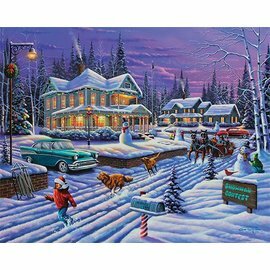 1,000 piece puzzle with a finished size 24” x 30”. 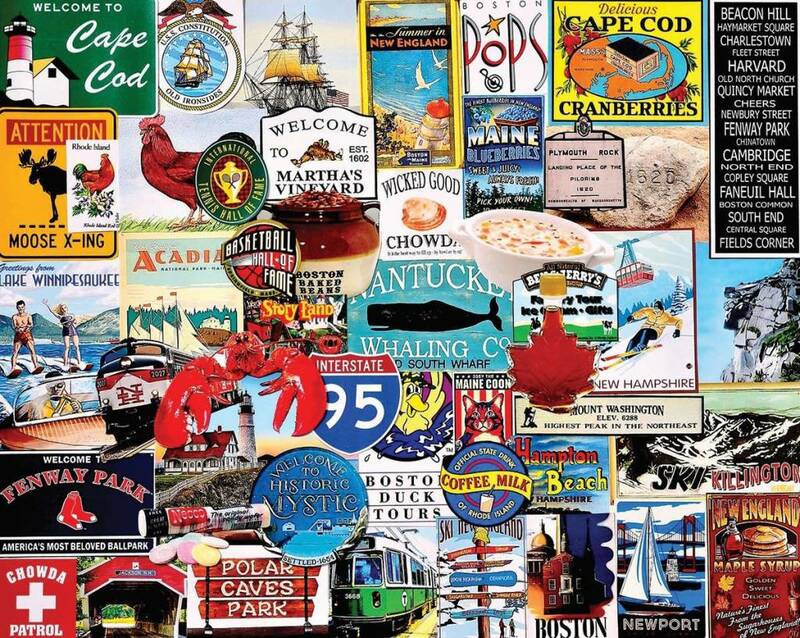 I Love New England - From Plymouth Rock at sea level to the highest point in the northeastern United States (our neighbor, Mount Washington), here are but a few of the reasons we love where we live. Our own Jackson Covered Bridge is featured as well as many other New England attractions. Artist Charlie Girard. 1,000 pieces. 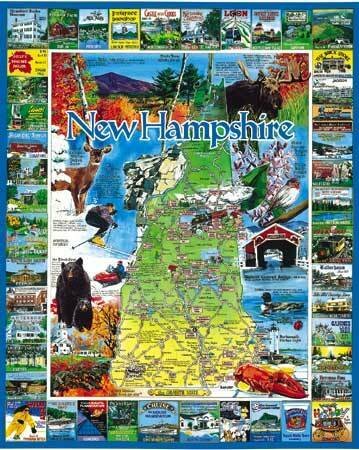 I Love New Hampshire - We Granite Staters are justifiably proud – we’re small, but full of superlatives. Eleven miles north of White Mountain Puzzles is Mount Washington, the highest peak in the northeastern U.S. which, until recently, held the record for the highest wind ever recorded by man – 231 miles per hour. 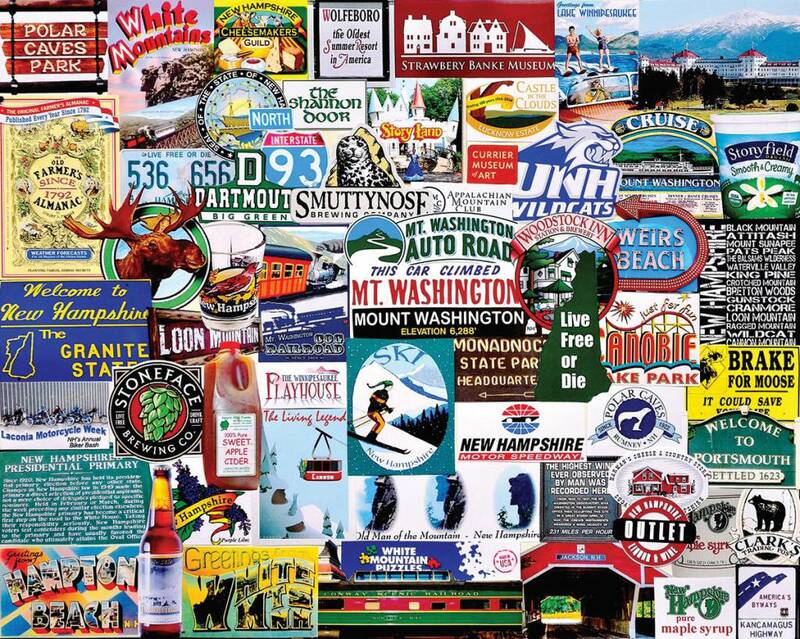 NH is home to Wolfeboro, the oldest summer resort in America, and the first in the nation Presidential Primary. The symbol of the state is the Old Man of the Mountain, the 40’ high rock profile that sadly collapsed in May of 2003. The Old Farmer’s Almanac, published since 1792, is based in Dublin NH. Closer to our Jackson home we have many attractions such as our treasured Covered Bridge, Storyland, the Conway Scenic Railroad, and the Shannon Door Pub (est. 1953). 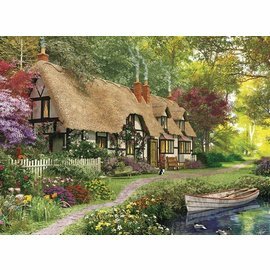 This 1,000 piece collage puzzle. Finished size 24”x30”. Beers of New England - We northern folk enjoy our beer, whether it’s in front of the fire after a day of skiing or at the fishing hole in summertime. 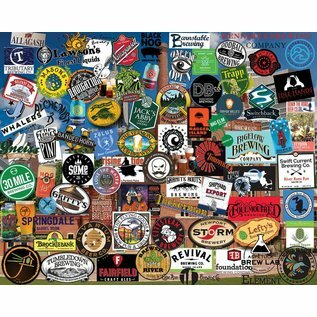 Designer Lois B. Sutton has assembled an array of colorful labels on this 1,000 piece puzzle, including the nearest craft brewer to us at White Mountain Puzzles – Tuckerman Brewing Company, located just down the road a piece in Conway NH. 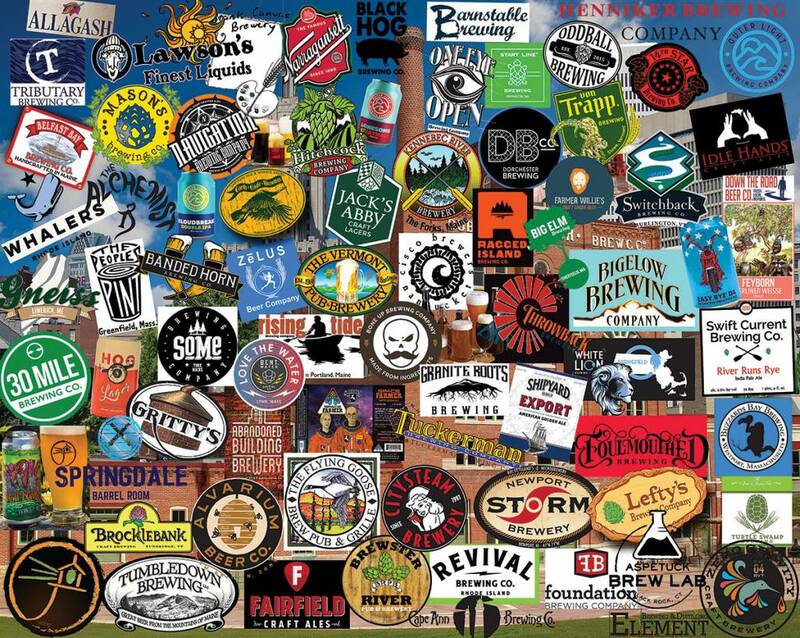 Many others with interesting names are also on tap here, like Allagash, Narragansett, Idle Hands, Lefty’s, Revival, Abandoned Building, Gritty’s, Hog, and The Peoples’ Pint. Finished size 24” x 30”.